« Day 37: Would you like bread sauce with that? After Christmas comes the traditional I-never-want-to-cook-or-eat-again lull. It usually passes after a few days, but until then it can be a bit of a challenge to motivate myself into going anywhere near the kitchen. However, the shops aren’t open until tomorrow and I need to come up with some ways to use up the left-overs and anything else sitting there in the fridge (aside from giving them to our greediest cat, who should have been called Hoover, in my opinion. She’ll eat pretty much anything). In the fruit & vegetable drawer I have: parsley, 1 kilo of bananas, potatoes, onions, carrots, beans, broccoli, the end of a courgette. lemons and clementines. Plus a small handful of sorry-looking mushrooms. After the overwhelming richness of Christmas fare, now’s not the time for culinary extravagance. 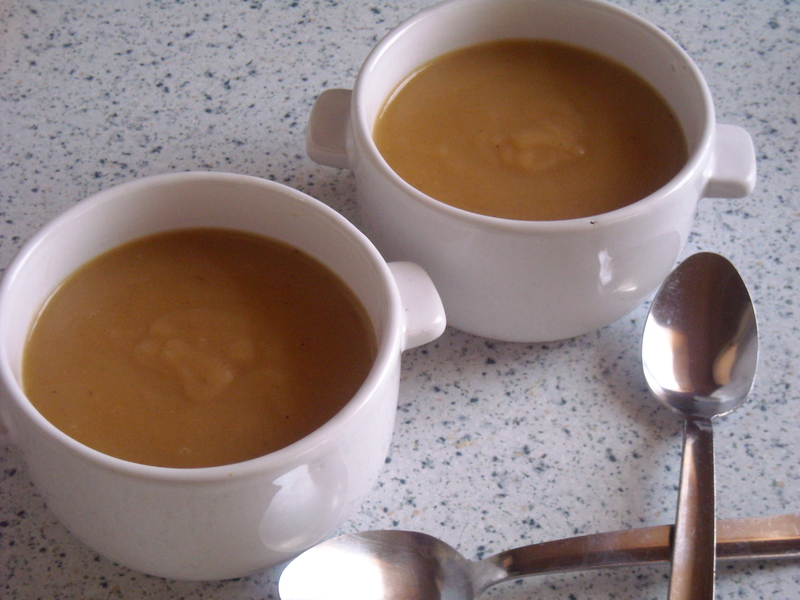 Eventually I find a recipe that suits most purposes – Vegetable Soup (Version 3). 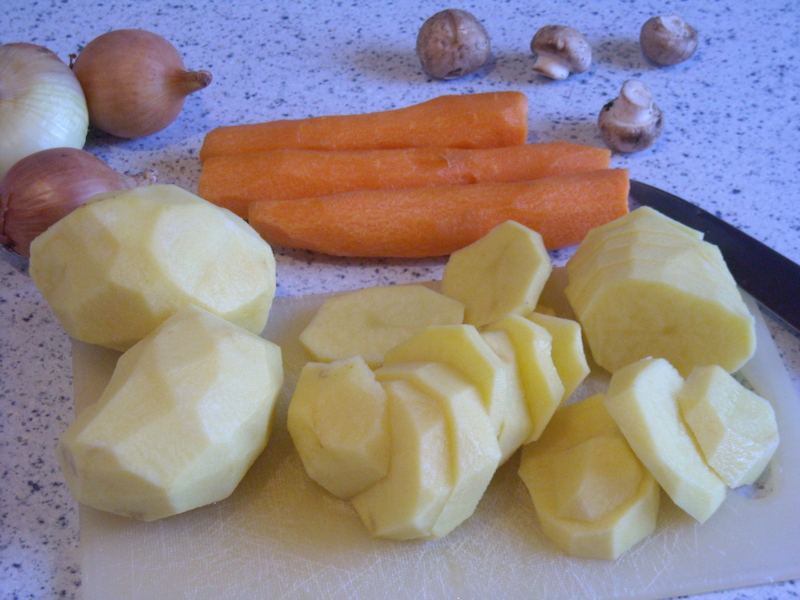 INGREDIENTS – 6 potatoes, 4 turnips, or 2 if very large; 2 carrots, 2 onions; if obtainable, 2 mushrooms; 1 head of celery, 1 large slice of bread, 1 small saltspoonful of salt, 1/4 saltspoonful of ground black pepper, 2 teaspoonfuls of Harvey’s sauce, 6 quarts of water. 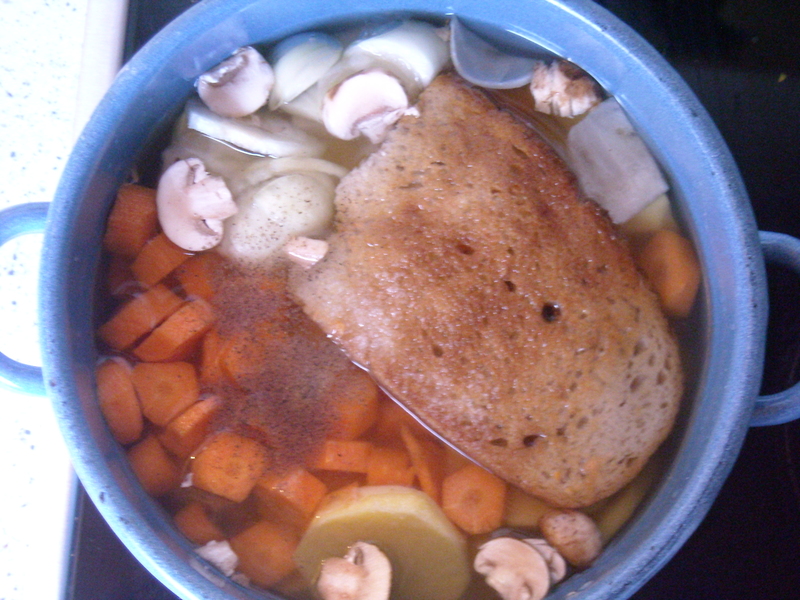 I didn’t have any turnip or celery to hand, so I added 1 extra carrot and onion. As for ‘Harvey’s sauce’, a little research revealed that it is a (by the looks of it) rather strong-tasting condiment used to enhance the base flavour of whatever you’re cooking. As a very approximate substitute, I also added a marinade of a little mixed garlic, soy sauce, vinegar and paprika to the final soup. You’re supposed to cook it for 3 hours, but my hungry stomach just couldn’t wait that long. 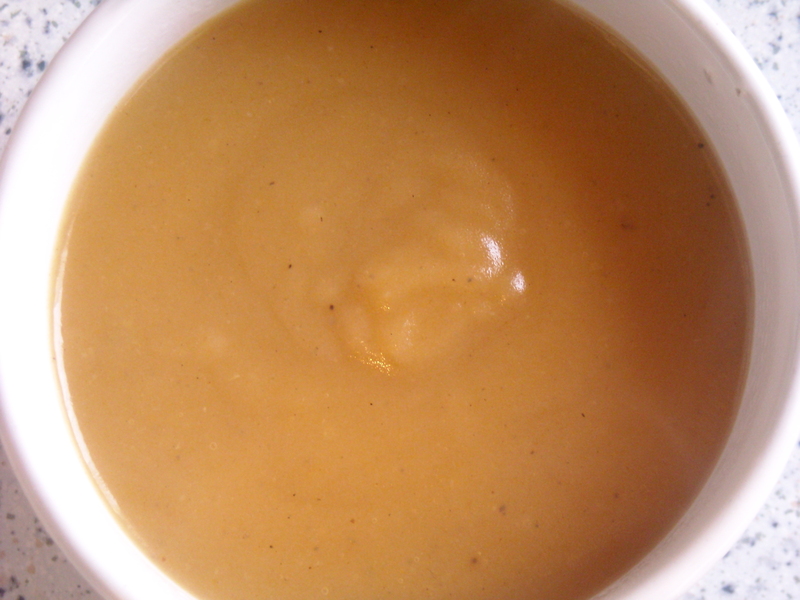 After 2 hours, I took it off the stove and blended it quickly before serving it up for a simple lunch. Very nice. This entry was posted on December 27, 2009 at 12:43 pm and is filed under food. You can follow any responses to this entry through the RSS 2.0 feed. You can leave a response, or trackback from your own site.